"It is well that war is so terrible, otherwise we should grow too fond of it." Indeed. Let's face it: war is cool in a lot of ways. The shame of it is that those ways tend to get negated completely by a photo of the bloated corpse of a dead young man. "On the occasion corresponding to this four years ago, all thoughts were anxiously directed to an impending civil war. All dreaded it--all sought to avert it. While the inaugural address was being delivered from this place, devoted altogether to saving the Union without war, insurgent agents were in the city seeking to destroy it without war--seeking to dissolve the Union, and divide effects, by negotiation. Both parties deprecated war; but one of them would make war rather than let the nation survive; and the other would accept war rather than let it perish. And the war came." The Federal dead at Petersburg or Five Forks, the GI dead in Normandy or the Ardennes, lost as much of life as any trooper dead in Iraq or Afghanistan. Yet can one say that the Civil War should not have been fought, or WW II? Hi, George -- There, for me, is where logic and a kind of "felt" truth diverge. I know how important WW2 was -- and I'm very proud of my own grat uncle who fought at Normandy -- but something in me says: "Nothing is worth the loss of human life on that scale." It is a contradiction in my thinking that sends me back searching for roots of thought. The necessity of certain wars is a necessity created by human flaw or by evil. If we would clean up our act as humans, such loss would no longer be necessary. When I think of, say, McClellan's tactical buffoonery (or what? arrogance? cowardice?) 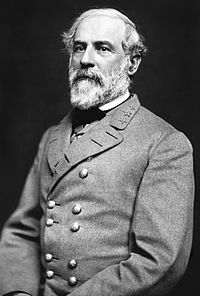 and how he could have ended the war at Antietam -- it just leaves me stunned. Slaver needed to end; the Union needed to be preserved; but so many died because of people's flaws . . . It's staggering to me. A tough nut to crack, for sure. Standing up for ourselves or against tyranny of an oppressed society are the excuses politicians use to engender national support, yet their motives are rarely, if ever, that chaste. We rally around our military and yet as times goes by, unless you are a military family or know someone serving, war becomes this abstract news bite fit in between local murders and the weather. It doesn't touch individual lives and until it does we won't be motivated to help put an end to it. If Afghanistan and Iraq were closer to the US and it was our homes and buildings that were being bombed, I'm sure this war would have never been permitted to last a decade. On a side note, funny you should mention “the bloodiest battle of the civil war”. I visited Antietam National Park just last year. Walking the battlefield where so many lives were lost was heartbreaking. I've never been one to believe in ghosts but there is a presence there that is… haunting. The trees stand like sentries on grounds that are pristine, with grass as green as shamrocks and yet to know how much life’s blood poured out where I strolled is still to me incomprehensible. Antietam has always been the one battle that has captivated and horrified me all at the same time. Maybe because it began on my sisters birthday (albeit over a century before she was born) or perhaps because we lost over twice as many men as was lost in WW2 on D-Day. From everything I have read over time, this war was much less about slavery as it was about greed and dominance. Those are the real evils. The North couldn't compete with a free southern workforce. And while I am proud that the North stood up against slavery, regardless of it's reasons, I am appalled that the government sanctioned discrimination was not only permitted but encouraged by so many for so very long. That alone shows that the motives weren't as pure as their rhetoric would have us believe. Lincoln did the right thing but not necessarily for the right reason. Politics, as always, played a much bigger part in how many of those decisions were determined. And while Lincoln was quite human with frailties all his own, he was an incredible and engaging writer. History depicts him with this innocent, infallible reputation. I believe that Lincoln, in essence wasn't as much a great man as a man who ended up doing great things. "From everything I have read over time, this war was much less about slavery as it was about greed and dominance. Those are the real evils. The North couldn't compete with a free southern workforce." Sorry, but do you mean "the Southern slave economy"? The West certainly had anxieties that way, ergo the troubles over Kansas. The North would likely have been happy to sell manufactures into a slave-holding South indefinitely, though it was developing an irritated conscience over the rendition of fugitive slaves. "History depicts him with this innocent, infallible reputation. I believe that Lincoln, in essence wasn't as much a great man as a man who ended up doing great things." Which history, outside the (Yankee) elementary school texts? I don't think that railroad lawyers have ever had much reputation for innocence. I cannot imagine a useful definition of "great man" according to which Lincoln was not one. He found an army in which the senior officers had real limitations. His cabinet at first had grave flaws--Seward entered 1861 with silly ideas, Cameron had to be sent off on a diplomatic mission. Yet Lincoln held things together through two and a half very difficult years before matters improved. "My paramount object in this struggle is to save the Union, and is not either to save or to destroy slavery. If I could save the Union without freeing any slave I would do it, and if I could save it by freeing all the slaves I would do it; and if I could save it by freeing some and leaving others alone I would also do that. What I do about slavery, and the colored race, I do because I believe it helps to save the Union; and what I forbear, I forbear because I do not believe it would help to save the Union." I think that is where people are critical of him as a leader. He wasn't St. Abe. That said, he did save the union and he did it without support of those around him, even in the white House itself. He also did it during the mourning for his dead eight year old son. He was a willow in a hurricane, for sure. I think he was a great man, but not the Saint many woul paint him as. He as a man, all in all, and a good one --a great one, perhaps -- btu not a god.